This stock is made from all natural ingredients to create a natural Umami. Umami is the G in MSG. This G (glutamate) can be recreated in natural form using certain flavours from certain food. 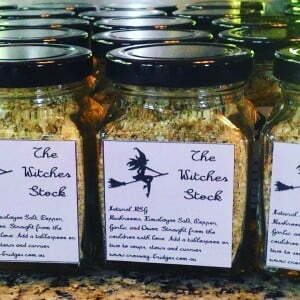 At the moment we have the Witches Stock that is suitable for all soups/stews/goulashes/stirfries. you can also sprinkle it on a boiled egg or over your salad and pizza bases. It is vegetarian and free from gluten, dairy, sugar and any preservatives. We use Himalayan salt to make it even more nutrient dense. Ingredients included in the Witches Stock are: Shiitake and Lion Mane Mushroom, onion, garlic, black pepper and Himalayan Salt. The witches stock. Paleo and vegetarian friendly stock. Straight from the Cauldron with love to you.